Stapler Economy 26/6 220 Half Strip An all metal heavy duty stapler from Osmer- Holds half strip of staples 24/6,26/6. 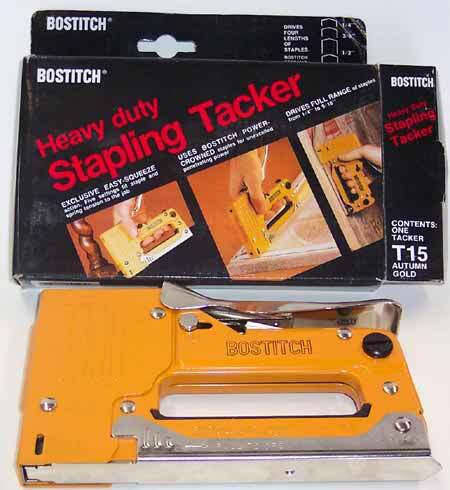 Stanley Bostitch 26/6 Stapler B440 Full Strip - An all metal heavy duty stapler holds a full strip of staples - takes 24/6, 26/6 staples. Heavy Duty Stapler Osmer 617 A heavy duty desk top stapler- Staples up to 100 sheets of paper- Uses 23/8 up to 23/17 staples . Very reliable machine from the Powerstone factory. Stapler No. 10 With Staples A sturdy stapler with staple remover and 1000 staples- for home,school or office use. 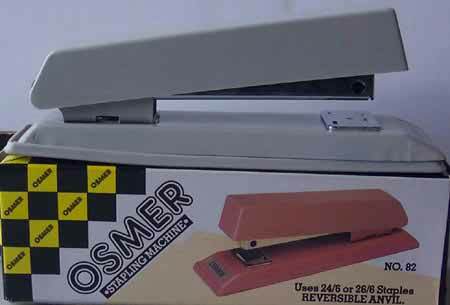 Osmer Heavy Duty Tacker Stapler - Durable all metal die-cast housing - steel magazine - ideal for plastics, leather, fabrics, soft wood etc. - Takes Osmer and Rapid series 13 and 23 staples in sizes 4 - 10mm - machine is similar in function to Rapid #23. Rapid R23 Tacker Stapler - Top quality , heavy duty tacker stapler - made in Sweden. Takes 13/4 - 8 staples. Rapid R13 Tacker Stapler - Medium duty tacker stapler - made in Sweden - takes 13/4 - 8 staples - in reality a good heavy duty machine. Stapler Electric LEDAH 26/6- Has a capacity of 20 sheets of 80gsm paper- 240 volt operation- takes standard 26/6 staples- Non skid base. Tacker Staples SP6DK- 6mm Pk1000 Staples for use in the Bostitch tacker T10CS- useful for Window screens, shelf papers, and light upholstery.